Friendship Bracelets are the must-have accessory. 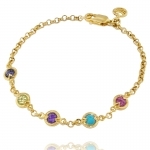 We have Silk Rope Friendship Bracelets as well as exquisite gemstone ones. Wear an armful of different colours and designs for a layered, on-trend look!